It’s remarkable how quickly the holidays bubble forth. No sooner do you dump Halloween candy into a storage bin (or rubbish bin) but the Thanksgiving dishes are piled beside the sink and every website is proclaiming unbeatable holiday sales. And yes, that car did just go by with a Christmas tree strapped to the roof. It’s enough to make you want to hide until mid-January. But what if there was a way to slow down the pace? One trick to ensuring you feel good about your holidays and come away feeling accomplished, complete, and able to really enjoy your time with your family is to sit down and do a little advanced scheduling. 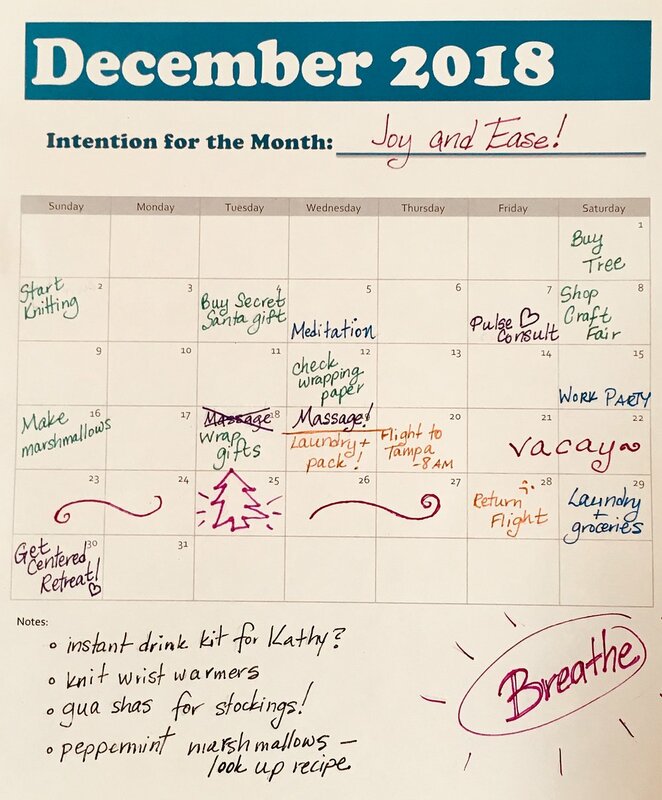 It may seem cold, but organizing your holiday preparations and celebrations on a calendar can help you break down overwhelming tasks and make choices about how you want to spend your time. It’s not too late, either. This year we are fortunate to have had an early Thanksgiving, yielding a little more time between now and New Year’s Eve. So, pull out a big calendar, or print out a blank December calendar and take a look at your days. It’s helpful to use a calendar that breaks down days by the hour. If you can, block out times that you’ve already committed to, the known obligations -- like when you’re commuting, working, or attending family functions. Now, add in the holiday events you already know about -- the school pageants, the office parties, the airline flights. What you have left is what you have to work with. Zero in on your “big deadlines”. For example, if Winter Solstice is your special time, think about what needs to happen for that event and about how long it takes to accomplish it. Food prep would need to be day of, or the day before. If gifts are important, look for large chunks of time where you don’t feel rushed so you can make or purchase some of what you need. Keep in mind, you can always keep an eye open for gifts no matter where you are. If you like making handmade gifts, be generous with the amount of time you allot to your crafting so you’re able to really enjoy the process. Schedule that as early as possible. One of the most important things to schedule is care for yourself. These can be little moments between things to breath, relax, stretch, and hydrate. See Part 1 of our series for 5 go-to suggestions. In addition to those precious moments of self care, consider getting the support you need to build a resilience practice and immune system for the holidays. Ideally, block off three occasions on your calendar for these special Ayurvedic treatments that can really do amazing things for your energy at this time of year. Give the dhyana Center a call within the next day to schedule your first treatment. We recommend starting your holiday season with a 1-hour Pulse Consultation. It’s easier to make healthier choices if you have expert guidance. 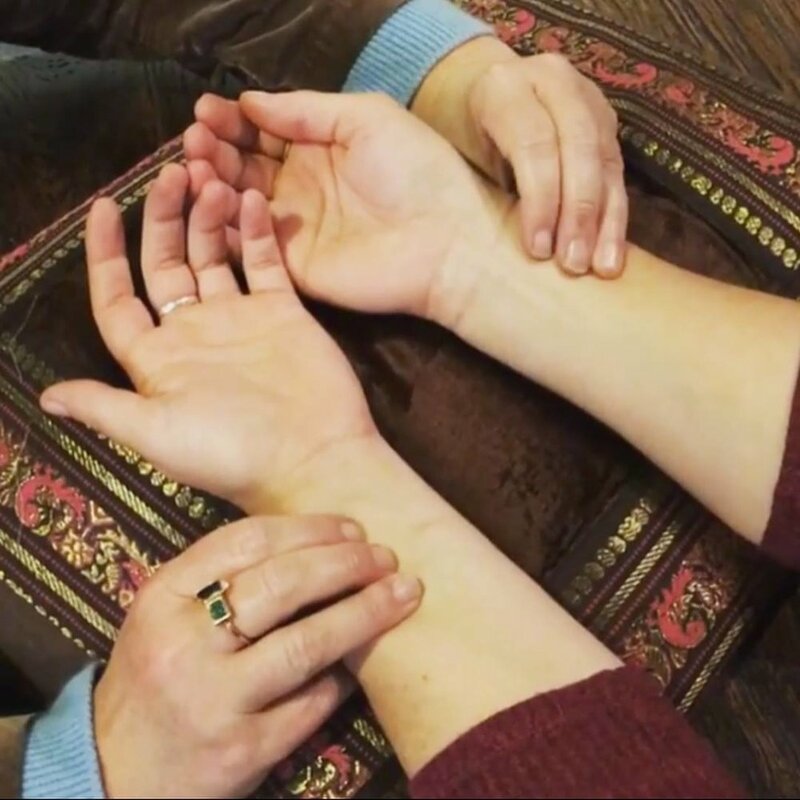 The dhyana Center’s practitioners are experienced at feeling the pulse at your wrist as well as analyzing other visible physical attributes for clues about how your body presents its balance and imbalance. They suggest the best foods and practices that can support you and help you feel energized. You’ll leave with key self care moves tailored uniquely to your body. And be sure to schedule a follow-up for late winter to see how any work paid off. Next, book a mid-holiday treatment to boost your energy and care for your body as you make your way through your personal preparations and wade through frantic or stressed energy coming off people around you. If you’re feeling depleted, ungrounded, and overwhelmed, choose a Nourishing Abhyanga. This massage is gentle, subtle work in which the practitioner applies copious amounts of rich, nourishing oils in sweeping movements of light to medium pressure. This is not a deep tissue or Swedish massage as you might be accustomed to in other spas, but a therapeutic treatment designed to bring relaxation and rejuvenation to your nerves while it delivers replenishment to your skin and herbal medicine via essential oils to your entire body system. This is an oil-rich treatment, but you can always ask for less oil if that is your preference. If you feel sluggish, unmotivated, or find you’re overindulging more than is comfortable for you, book a Lymphatic Massage. This is deep, powerful work that gets your circulation and lymphatic system moving. The practitioner utilizes special tools to help move any stagnant places in your body systems, ensuring that toxins move out. This is one of the dhyana Center’s best treatments for immunity and overall vital functioning of the body. And this treatment comes with a 20 min pulse check-in - so you can see how your body has changed. Finally, schedule a Day Retreat just before the holidays draw to a close or immediately after the big parties have concluded. This truly renewing gift to yourself can reset your body, ease your mind, and help you feel abundant and spacious. It works well before your holidays have culminated by give you a boost as you go into what might be a high-stress social setting, centering you and allowing you to let go of tension that may steal your joy. Booking a retreat for after the holidays can be your reward for a job well done, giving you back any energy you may have lost in the bustle of visits. A day retreat starts with a morning yoga class, unlimited time in our self-care sanctuary for the day, your choice of drink from our Apothecary bar, a salt-soak to take into the bath, and an arrangement of treatments to your particular goal. Whether its Getting Centered, Tension Tamer, Nourishing the Soul, or a Sacred Shirodhara, there’s a retreat that’s just right. And the benefit to booking this now is that you can receive 10% off through December 21st. As the days pass, check in on your calendar to make sure you feel on track. You can add and subtract items as you choose. Enlist your loved ones to take on tasks. Allow yourself to the power to establish the way the holidays look for you. You may find that this is your best season yet! All these treatments also make great gifts. Don’t forget you can receive 10% off a 3-hour lymphatic massage gift card. Check our online store for more gift ideas to help you spread the self-care joy to those you love.